A mere 480 years after Henry VIII told Rome to take a hike, the Church of England is finally on the verge of admitting women to the leadership position of bishop. The AFP reports that the General Synod, the church's governing body, will vote Monday on the matter. Rank-and-file clergy positions have been open to women since 1994 (shout-out to the Vicar of Dibley), and they can become bishops in the American and Canadian Anglican churches, but the job is still off-limits in the U.K. Never mind that noted female human Queen Elizabeth is the big-cheese defender of the faith, of course. "This has been on the agenda of the Church since the 1920s, from the time of the suffragettes when women were saying actually, we're human beings, we don't want to be patted on the head and told: 'There dear, you'll be alright doing the flowers or making the cups of tea'. "We have gifts and skills and abilities and we want what we have to be placed on the table as well." If the English church makes the switch, it's likely to reverberate among other Anglican groups, as well. 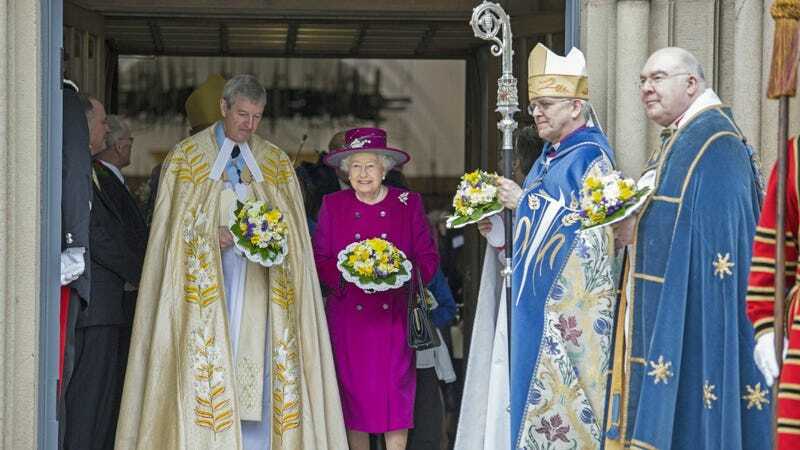 It's not like there's no precedent for the Church of England simply changing its rules; the denomination was, after all, created when a gouty king couldn't wrangle a divorce out of the pope. It was almost immediately used to seize a bunch of monasteries and enrich the crown. So it's tough to say, "It's not like we can just rearrange matters willy-nilly!" Options under consideration include an immediate dissolution of the synod so that fresh elections could produce a sufficient majority by November, or even a move by the bishops in the House of Lords to introduce the legislation without synodical approval. Glad to know the House of Lords still has something to do with its time!